First, I'll announce the winner of THE WHITE ASSASSIN and THE VISION. Congrats! E-mail me your addresses so I can send you your book. Today I’m so excited to interview Wendy, a 9th grader who follows our blog and an aspiring author for my ASK THE EXPERT series. Welcome Wendy. Thanks so much for agreeing to be interviewed. Hi, I'm Wendy. I live and go to school in Australia, and I love reading and writing. I mostly read fantasy, dystopian and realistic fiction. My favourite authors are Markus Zusak, Glenda Millard, Janice Hardy, Patrick Ness, Eva Ibbotson and J.K. Rowling. 2. I love how we’re able to meet each other from across the world through blogging. And I love Janice Hardy and J.K. Rowling too. I know you’re an aspiring author. Tell us a little bit about what you’re working on. I'm in the middle of revising a middle-grade fantasy novel at the moment. Basically, it's set in a world where there are dangerous magical beings who can take the souls of people. When one takes a girl's friend's soul, she approaches them, and discovers she has powers and a connection with the beings, which she'll need to help her friend and prevent a war. 3. Ooh, your story sounds awesome. As you probably know, I’m a huge fan of fantasies. And yea for another middle grade author! Before you started writing, how did you find out about the books you read? What about new books coming out? My school library has lists of books — for casual reading and on specific topics — that the librarians put together and I'd often find out about new books to read from there. I'd also look up books I'd heard a lot about from other people. I don't think I really paid attention to new books coming out before I started writing (well, except for Harry Potter). 4. That’s so interesting that you didn’t pay attention to new books before starting to write. How has writing changed what you read, if at all? What books are you waiting to be released? I don't think it's really changed what kinds of books I read because I liked the same genres before I started writing, but now I read more books from different authors. Before, I mostly stuck with my favourite writers. I'm waiting for Bridge of Clay from Markus Zusak, Clariel: The Lost Abhorsen from Garth Nix and Darkfall by Janice Hardy to be released. 5. I’m looking forward to THE LOST ABHORSEN too. There’s still a chance you could DARKFALL in my contest. (For everyone, the link to the contest is at the top of the blog.) Do you buy most of your books or get them at the library? How often do you go to a bookstore? I mostly get books from the library. I only go to the bookstore once every few months, because the nearest one is over an hour away, so it's a bit inconvenient. I usually go to the library when I'm after a specific book, and I go to the bookstore when I just want to browse. 6. That’s too bad there’s no bookstore nearer. Do you read any teen book blogs, author blogs, or author or publisher websites? Become a fan of an author on Facebook? Why? Has this changed at all since you started writing? Yup, I read Janice Hardy's and Steph Bowe's blogs. I don't have Facebook but I follow a lot of authors on Twitter. I sometimes go to author websites, when I've just read a book by them and search them up. I don't really look at teen book blogs or publisher websites. I didn't have Twitter or subscribe to any blogs until I started writing, so that's changed quite a lot. I follow Steph Bowe's blog because I like reading her thoughts on things, and Janice Hardy's blog because the writing info there is really helpful. 7. I so agree about Janice’s website. Have any of your teachers recommended any blogs or websites to your class or to you? 8. Are there things your favourite authors could do that would make you more likely to visit their website, their blog, or become a fan on Facebook? Well, I love J.K. Rowling's website because there's extra information on the books and characters, she answers questions directly, it looks great and it's interactive. I'd definitely visit an author's website if it was something like that. For blogs, it would be nice if they were updated regularly; a lot of authors only update them with book news once every few months. I'm not really sure about Facebook or Twitter … maybe if they put a link on their website? I'm not too fussed about how active the people I follow are on there. 9. That’s a great point about blogs. I notice sometimes that bloggers just disappear for periods of time. It helps when they at least tell us in a blog post that they’ll be gone. And I really think disappearing hurts readership of a blog. Have any authors visited your school? Who? Is there anything you’d recommend that an author do to make their presentation more interesting to you and other kids at your school? Yes, my school held a literary festival last year and a lot of authors visited. I got to listen to John Larkin, James Roy and J.C. Burke. I really like humour and anecdotes in presentations, usually that makes it more interesting. And this might sound a bit strange, but I like it better when the author moves around and looks at the audience more (if possible, of course); it was what James Roy and John Larkin did. When they're just standing still I kind of feel like I'm being 'lectured' to, but if they move around it somehow feels friendlier. Hope that makes sense. Oh my gosh, I would so love if my daughter’s school would have a literary festival. That’s such a great way to get kids excited about books. Thanks so much Wendy for sharing your advice. And good luck with your book. 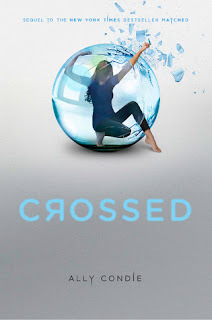 Today I’m giving away my ARC of CROSSED. See isn’t it a book you’re dying to read? This is an awesome sequel to MATCHED told from Cassia and Ky’s POV. I loved learning about the Outer Provinces as Cassia searches for Ky. And we get to meet new characters like Cassia’s travelling partner Indie who have their own hidden pasts and goals that drive them to face the dangers in the Outer Provinces. Both Cassia and Ky must confront hard inner decisions that raise the stakes and that I didn’t see coming. And of course we learn more about Xander. So I’m giving away my ARC of CROSSED. All you need to do is be a follower (just click the follow button if you’re not a follower) and leave a comment on Wendy’s interview by midnight on October 29th. I’ll announce the winner on October 31st. If your e-mail is not on Blogger, please list it in your comment. International entries are welcome. Here’s what’s coming up the next few weeks. On Wednesday, there's going to be a guest post by someone who found her agent through Literary Rambles and has a book deal. She'll be sharing tips on agent hunting and the submission process. I don't want to miss it. Hope you'll come too. Next Monday I’m interviewing debut author Stasia Ward Kehoe and giving away a copy of AUDITION. Then on October 31st, I’m interviewing another debut author Anna Staniszewski and giving away a copy of MY VERY UN FAIRY TAIL LIFE. On November 7th, I’ll be interviewing Adam Jay Epstein and Andrew Jacobson and giving away a copy of THE FAMILIARS SECRETS OF THE CROWN. Great interview, thank you for sharing! And can I just say how much I love this cover? It's gorgeous! Wow, Wendy. I'm so impressed with you and your school sounds amazing. I wish my children had the same opportunity. Keep up the good work. Now what a fabulous interview and giveaway!! Wendy is fabulous and I'm with Miranda, your school sounds amazing! More schools should be like that! Stay fabulous! I'd love to be entered for the book. I'm addicted to Matched so I know Crossed is going to be delicious! I'm looking forward to your future interviews! They sound fantastic! Thanks for the great advice Wendy and good luck with your book. Vicky, Miranda, and Jen, I agree. Wendy's school sounds awesome. great interview and I am so excited to read this book, you have NO IDEA!!! Thanks so much for sharing. JK Rowling rules. What a fascinating kid! Congrats to all winners. Wendy, your premise of soul stealers sounds interesting. Good luck! Fascinating interview, Natalie. Wendy, your school sounds amazing. I'm so sorry your nearest bookstore is over an hour away. AAGGHH! But glad to hear you support your local library. If everyone just browses when they're in a bookstore and nobody actually buys anything, that bookstore will eventually go out of business. People don't seem to realize that! Natalie, I already have a copy of CROSSED, so don't enter me in your giveaway. Nice review, though. I like J.K Rolwling too. Crossed sounds awesome. Just love the story premise. Great interview. Great interview! You're amazing, Wendy. My favorite authors are JK Rowling and Markus Suzak too. What an inspiring young lady! I love that she's only in 9th grade and already working on a book! It sounds like it could be a great story! Great interview and what a fantastic school! Great interview. Exciting to hear from people all over the world!!! And to see young adults reading AND writing! YAY! I love hearing a student's perspective about reading and writing. Wendy, you have so much more appreciation for both reading and writing than I did at your age, it's awesome. Thank you both for the interview. Great interview, Wendy! I love that you're writing a middle-grade, and it sounds like a really cool idea. I want our school to have a literary festival!! How cool! Wendy, you sound like one amazing 9th grader--thanks so much for sharing with us!! This was GREAT--thx Wendy for that invaluable insight! And SO excited to read CROSSED!!! Loved Wendy's interview! So insightful!! I didn't really pay attention to new books until this year. Now I have a general idea of what the summaries are without having to look at the back or inside flap when I'm at the bookstore. It's interesting how that changes sometimes. Fabulous interview! It's so awesome to meet young writers. And I would LOVE an ARC of Crossed! And I've heard so many good things about AUDITION - count me in! Wendy, your book sounds great! Keep it up! I love Marcus Zusak and Patrick Ness, too. I'm so excited for Crossed. I'd love to win! Thanks! We like a lot of the same authors, and I like your story idea. I also agree that dynamic presenters are more fun to listen to than the lecturing variety. Thanks for the great interview! Wow I wish I was as "with it" as Wendy is when I was her age. You go girl. Fun interview. Wow, Wendy. You sound so with it. I wish I'd had that much focus when I was your age. I have no doubt you'll succeed in anything you set your mind on. Good luck with it! @Janice Hardy -- no problem! Wendy, I just finished reading Darkfall by Hardy. It was really good. I love when a trilogy ends well. I love hearing Wendy's view on blogs, and especially teen blogs. Interesting. But it doesn't surprise. Great interview! Nice to meet you Wendy and thanks so much for giving your perspective on all things bookish! Hooray for Wendy working on her book already. I've always wished I had the guts to starting writing a book when I was younger . . . good luck! And as for the giveaway book -- what an eye-catching cover! Great interview and now I am super excited about the new Nix book. All his books are fantastic, especially his short stories. Good luck with everything young lady. Fantastic interview!! Your school sounds fantastic, Wendy, and I wish you much success with your novel. I'd read it! Wendy: that's excellent! Thanks so much. Glad to hear you're still supporting bookstores. Holy crud, you live in Australia? Really? Lucky. Wow, Australia has a lot of authors. Wonderful interview! :) Thanks so much for the giveaway!! Good luck, Wendy! Great interview! Man, I wish my school had had a literary festival. So cool! I am SO excited to read Crossed!! I love these interviews, Natalie. Wendy sounds like she is firmly on her way!! Great interview. Loved Matched and eagerly anticipating Crossed. Actually have it preordered on Amazon. J.K Rowling <3 and awesome interview!! Great job Wendy! It's great to hear about teenagers that I have a great goal that they are working towards! I would love a copy of Crossed! Wendy, you are an inspiration to other teen writers. I wish you lots of luck in your literary career. I liked "Matched" quite a lot. I'd already read quite a bit of dystopian YA, so I wasn't sure if I was ready for more, but "Matched" stood out. Though I read it half a year ago, many scenes are still with me. Yes, please enter me in the contest for "Crossed."